New 2017 Maruti Dzire – Technical Details, Design Review & Other Info! 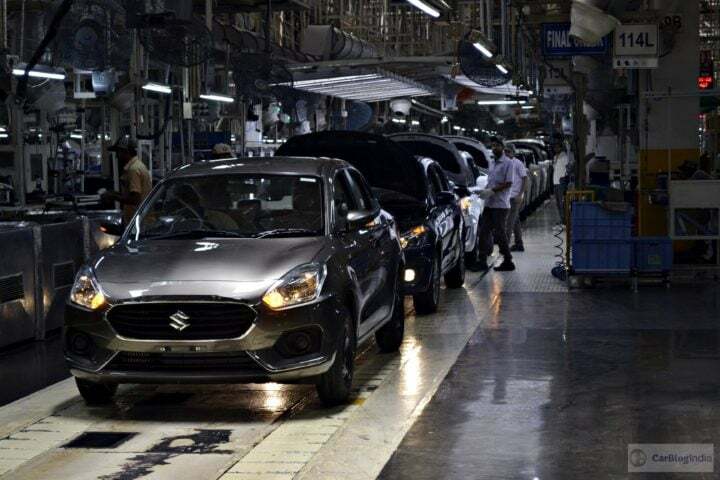 The new Dzire is being built in the Plant-A of MSIL’s Manesar facility. 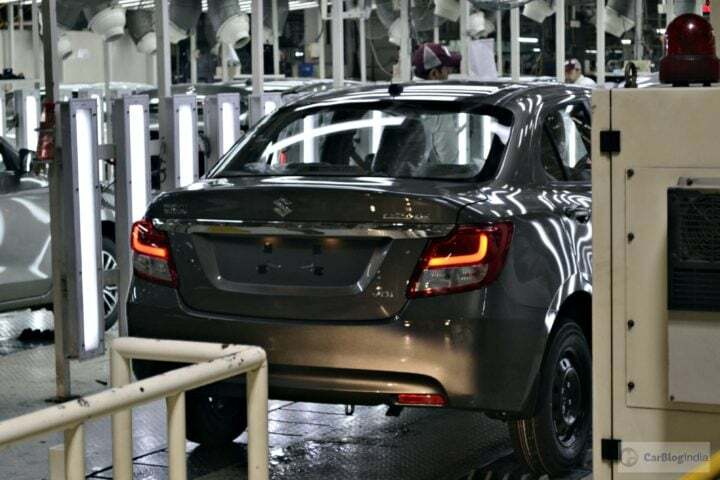 Recently, we visited this manufacturing facility to take a look at the manufacturing processes of the 2017 Maruti Dzire. This post here will take you through different aspects of the new vehicle whilst focusing more on the technical details. While our new 2017 Maruti Dzire review will soon give you an idea of how good this car is to drive, this post, here, highlights the manufacturing processes and other technical details related to the new Dzire. 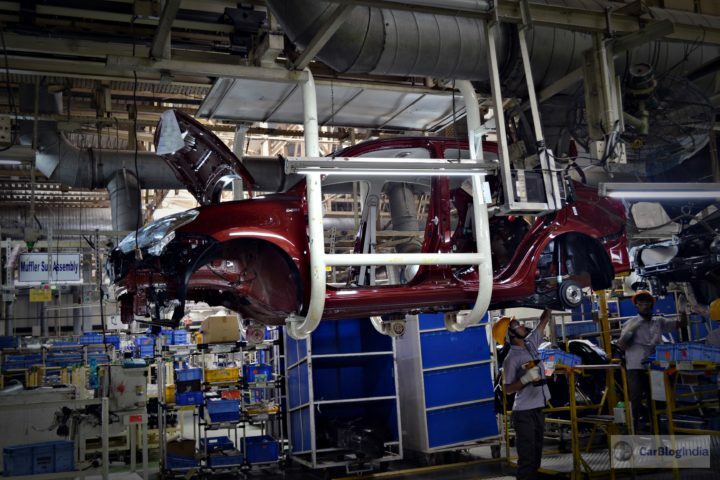 Production of the new 2017 Maruti Dzire takes place in Plant A of MSIL’s Manesar production facility. For the record, Maruti’s Manesar facility is spread across 600 acres and has an average production capacity of 3100 cars a day. 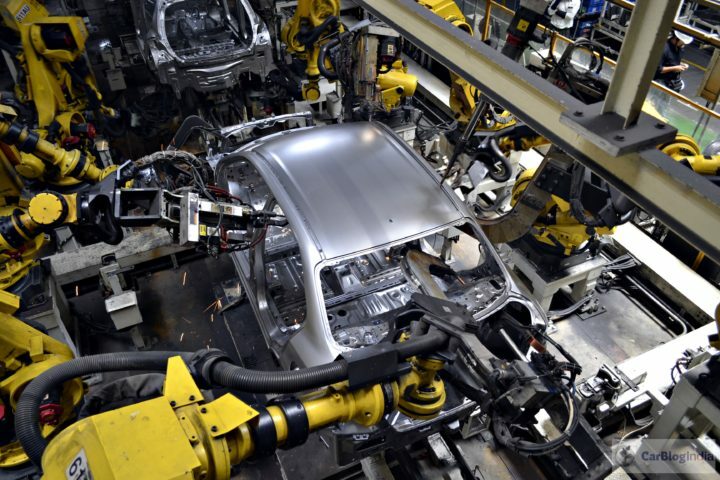 The manufacturing facility has a workforce of 7,000 humans and 1,100 robots. The facility has boasts a ‘Zero Water Discharge’ setup and benefits from steam turbine generators and a 1 MW solar power system. Only 2% of its power needs are required to be met by the government’s electricity supply. The Plant A comprises of a – Press Shop, Weld Shop, Paint Shop, Assembly Shop and a Vehicle Inspection Section. Press Shop: This is where metal sheets are cut and shaped into body panels using heavy duty stamping machines and dyes. This plant produces a panel every six seconds, which means as many as 2 million panels are produced every month! While the process of cutting and shaping of steel doesn’t involve a human hand, the panels are manually checked at regular intervals to ensure a high quality. Weld Shop: The panels then reach the weld shop, where they are unified to form a car body frame. The weld shop too is fully automated, which means human intervention is limited to periodic supervising and quality checks. Paint Shop: The paint shop of this plant employs as many as 40 robots, which can paint in 27 colours. Assembly Shop: This is the stage where all the parts come together to give birth to a car. Vehicle Inspection: In the last stage many tests are done to ensure that the car is ready to be rolled out of the factory. The 2017 Maruti Dzire is underpinned by Suzuki’s 5th generation B-platform. Christened ‘HEARTECT’., this new-age platform is light, rigid and strong. Hence, the new platform goes on to play an important role in enhancing the vehicle safety and performance. Being light in weight, thanks to use of high-tensile steel in its construction, this platforms help optimize the performance and fuel efficiency. Our new 2017 Maruti Dzire review should give you a good idea about the new platform’s benefits in areas of stability and handling. Apart from all this, Maruti goes on to insist that the 5th-generation HEARTECT platform enhances the rigidity, strength and crash safety of the car. Like we have been saying, the new Dzire 2017 model was developed alongside the latest Swift. This means the new generation Maruti Dzire doesn’t share too much with its sibling. 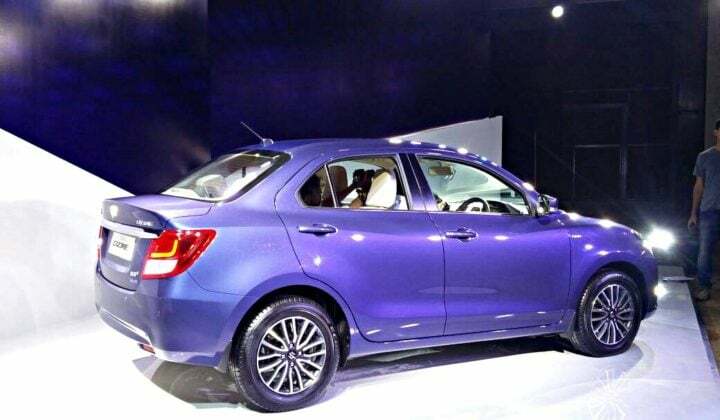 That said, the two cars still share many bits between them, but this around, the designers at Maruti have done enough to give the Dzire its own unique identity. No wonder then, that, the latest 2017 looks more premium and has better proportions than the earlier model. Up front, the new Dzire gets a bumper and grille combo that looks much different than that of the new Swift. There’s enough chrome to keep our bling-loving buyers happy and the car looks sufficiently upmarket. While this has robbed off the sportiness that can be found on the new Swift, it has definitely made the new Dzire look classy. The headlamps now have LED projectors. Even in its side profile the car looks pretty interesting. The car’s silhouette is all-new and even the design of the A-pillars isn’t the same between the new Swift and the new compact sedan sibling. The rear is totally new, too. While the compact sedan format ensues the boot continues to look stubby, the new LED taillamps give the posterior a very upmarket touch. The interior is a reflection of the exterior. Akin to the exterior, the interior of the new Dzire doesn’t look too much like that of the of the new Swift. Compared to the all-black colour theme of the Swift, the Dzire gets a beige-and-black combo. Also, there’s enough faux wood to impart a touch of premium-ness to the cabin. 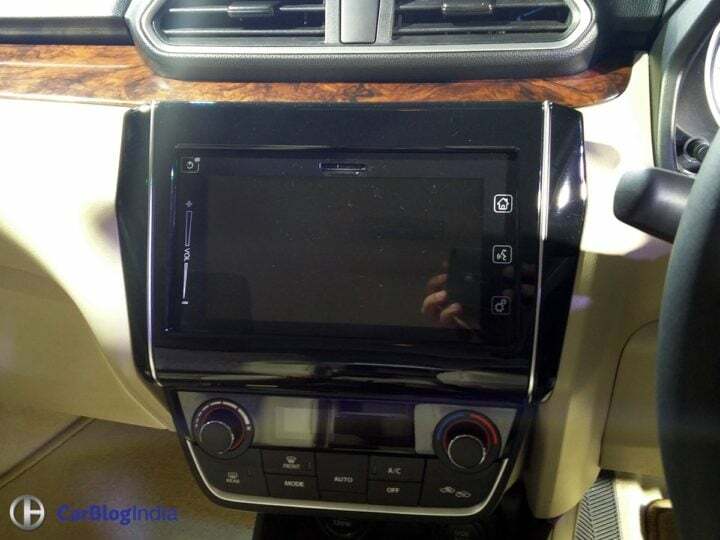 While the Swift gets round AC vents, the aircon vents on the new Dzire’s dashboard are trapezoidal in shape. Our most favorite bit, however, is the flat-bottom steering wheel, which goes on to infuses a sporty touch with the cabin. Apart from this, the interior now has a lot more space to offer. This is owing to a longer wheelbase and a wider track than before. This means seating 3 adults in the rear should no more be a thing of worry. Even the materials used in the interior seem to be of better quality than before. While the new Dzire is completely new in most aspects, it continues to use the same engines as before. While you can find more details in our new 2017 Maruti Dzire review, we’re pretty sure Maruti will re-tune both the motors to offer more in terms of refinement and efficiency. Also, unlike last time, the new Dzire offers a 5-speed AMT on both Petrol and Diesel models. While the Petrol variant’s 1.2 L K-series, 4-cylinder, normally-aspirated engine outputs 87 PS-115 Nm, the Diesel model’s 1.3 L DDiS, 4-cylinder, turbocharged engine outputs 78 PS-190 Nm. Both the engines come along with a 5-speed Manual transmission as standard. ARAI mileage figures are 22 KMPL for the petrol and 28.4 KMPL for the Diesel model, making the Dzire the most fuel efficient car in India. A modern platform, new features and additional safety equipment has lead to an increase in the prices. The Dzire range starts at Rs 5.45 lakh and goes all the way to Rs 9.41 lakh. Stay tuned to CarBlogIndia for a comprehensive new 2017 Maruti Dzire review with test drive details. 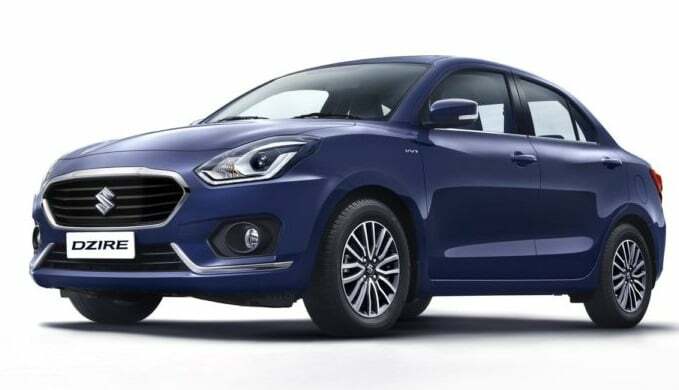 What do you feel about the new 2017 Maruti Dzire? Are you planning to go have a test drive of this car? Do let us know by sharing your views in the comments section below.